Prepare yourself for a relaxing driving experience on the island of Kauai. Surprised? Kauai is small. No jet-speed freeways here! Do I need to rental a car on Kauai? The island's smaller roads have lower speed limits. Yet, Kauai towns and destinations are close, so it takes only a few minutes to reach them. No matter whether you choose an economy car, a minivan, or a convertible from Aloha Discount Kauai Car Rental, you'll find Kauai is a fun place to relax and see the sights at your own pace. Our goal is to save you money on your car rental so you can comfortably take part in a luau, rent an ATV, take a helicopter ride, play golf, enjoy a sunset cruise or buy souvenirs for your friends back home. Whatever your budget, whatever your style, AKauaiCarRental.com has the perfect vehicle to make your vacation memorable. All of Kauai is scenic! The drier, south-side, of the island is a snorkeler's paradise. Turtles and colorful fish are abundant in the turquoise waters of Poipu beach and other lovely shores nearby. The north-side of Kauai holds tropical splendor at every turn. From wild, fragrant flowers along the roads to rushing waterfalls, the scenery is lush. Not to be missed is beautiful, 3,000 feet (900 m) deep, Waimea Canyon State Park. Nor can any visitor pass up the chance to enjoy the fresh produce and fish available in small markets throughout the islands. AKauaiCarRental.Com invites you to check out our rates and request the vehicle you feel will most likely suit your needs while you enjoy the relaxing beauty of Kauai. On the island of Kauai condos and resorts are plentiful. Driving on Kauai - Highways and surface roads have lower speed limits than mainland United States. Lihue Airport (LIH) - The airport is located two miles east of Lihue, on the southeast coast of the island of Kauai. The airport does not serve as a hub, although, numerous inter-island flights are available daily. United Airlines has non-stop daily service to the mainland cities of Los Angeles and San Francisco, and weekly non-stop service to Denver. American Airlines also offers non-stop daily service to Los Angeles; and recently US Airways began offering non-stop service to Phoenix, Arizona. Alaska Airlines has also announced a new service to Seattle which began in October 2007. The airport's runway can accommodate planes up to the size of a DC-10. The airport is mostly un-walled, and the check-in is completely outside. The airport is the primary gateway to Kauai for visitors, and has multiple rental car facilities. View a car rental map for the Lihue airport in Kauai, Hawaii. 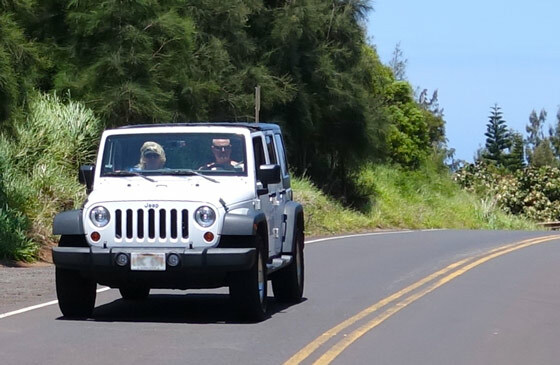 Our most popular rentals in Lihue, Kauai are the 4 door Jeep Wranglers. Offering 2-door and 4-door models. We have a Jeep hire for your group of 1-5 persons.